People think blues music is just about jilted lovers, juke joints, and bad times, but it is also about courage, survival, love, and even forgiveness. The music reflects life in its many aspects; happy, sad, tiresome, painful, or fun. The music grew out of African Americans' struggles in this country, and its early origins included field hollers, work songs, and spirituals. These influenced blues, jazz, rock and roll, country, bluegrass, hip hop, and almost all modern music. Blues musicians are in tune with the spirit of their music and understand the communal and healing power of the songs they sing. 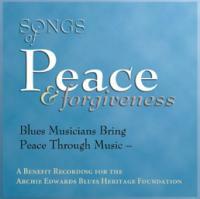 In Songs of Peace and Forgiveness, they testify to the spiritual side of their artistry and demonstrate their essential commitment to bringing peace through music. The songs complement the general concepts in the books Peace and Forgiveness and Poems of Peace and Forgiveness by Jefferson Glassie. But each song specifically evokes the artist's individuality and philosophy of life. They all do believe we can have a better world. All songs are either originals by the artist or a colleague, or traditional pieces in the public domain. 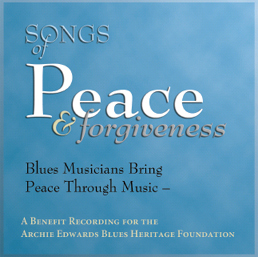 Each artist has contributed the song without receiving any compensation in support of the spirit of the project and to help preserve a cherished institution in Washington, DC, the Archie Edwards Blues Heritage Foundation. The Foundation is a nonprofit, tax exempt Section 501(c)(3) charitable organization that operates the well-known "Barbershop," where the late Archie Edwards cut hair for decades, and where on Saturday afternoons they drew the blinds, pulled out the libations, and played the blues. Archie played acoustic, Piedmont blues with a driving alternating bass line. Mississippi John Hurt, Skip James, John Cephas, and Phil Wiggins were among those who played at the Barbershop. Today, blues musicians and their friends still come by the Barbershop to jam on Saturday afternoons. There is a tremendous feeling of brotherhood and community. The audience is diverse and everyone is welcome to play acoustic blues or just come and listen. The Barbershop is a place of peace and part of that better world we all strive for each moment. During his life, Archie was intent on passing the music on to future generations, and the Foundation continues his legacy. We hope you will enjoy this music and the messages brought to you by these talented and dedicated musicians. If you enjoy the music, please visit their websites. Lyrics and liner notes for the songs are here in the sidebar. Your gratitude for their work are the only compensation they will receive. We truly can bring peace through music, for if even one song helps love grow in this world, we are succeeding. We extend our thanks to all the musicians, engineers, sound guys, and others who contributed to this production. The CD was mastered by Eric Weinberg, Little Erich Music Studio, Burke, Virginia; www.littleerichmusic.com. Special thanks to Gaye Adegbalola and Suzanne Moe, who provided incredible love and support for this project from the beginning (and Suzanne especially for graphic design of the CD and cover, see www.sumoe.com), and to Mark Kinniburgh of Rent Party Studios, who produced this CD and has helped us tremendously in our eclectic adventures.